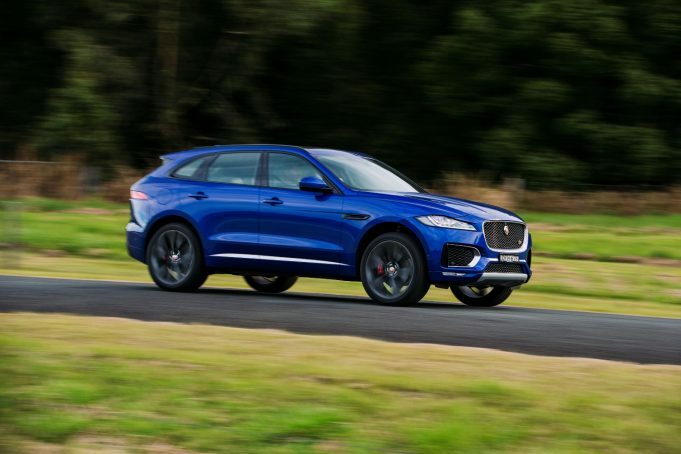 A WICKED price, unrivaled dynamics, and a body shape that borrows from the incredible F-TYPE performance super car will represent the iconic Jaguar brand when its F-PACE performance SUV goes on the market on August 1. The entry level F-PACE Prestige 20d will debut under $75,000 (plus on-roads), powered by the clean and responsive 132kW Ingenium diesel, while other engine options will include a scintillating high performance 280kW supercharged V6 petrol engine (let’s not forget this is an SUV). Developed using Jaguar’s Lightweight Aluminium Architecture, the F-PACE features a bold front grille and the muscular bonnet hints at the performance potential of engines like V6. Elements such as slender full-LED headlights, forged 22-inch wheels and short front overhang carry the design vision of the C-X17 concept (on which the F-PACE is based) through to production. To celebrate the launch of the all-new F-PACE, a special model called the First Edition will be available in strictly limited numbers and in the first year of production only. Powered exclusively by the 280kW supercharged V6 petrol and 221kW V6 diesel engines, the First Edition is distinguished by two unique metallic paint colours – Caesium Blue and Halcyon Gold; clear references to the breakthrough C-X17 concepts unveiled at the 2013 Frankfurt and Guangzhou Motor Shows. Customers can also choose from Rhodium Silver and Ultimate Black. Further highlights include 22-inch Double Helix 15-spoke wheels with Grey finish and contrast inserts, Adaptive Dynamics, full-LED headlights, Gloss Black fender vents and a sliding panoramic roof. Inside, the Windsor soft-grain leather seats in Light Oyster feature twin-needle stitching and an embossed hounds-tooth pattern influenced by the C-X17’s award-winning interior. The traditional Jaguar craftsmanship blends seamlessly with the configurable 10-colour ambient lighting, state-of-the-art InControl Touch Pro infotainment system and the 12.3-inch HD virtual instrument cluster. A total of 12 model variants will be available in the range (including the two first edition models), with the 35t First Edition topping the pricing at just over $120,000 (plus on-roads).